In conjunction with our exit speed bat testing and our barrel size measurements, we weigh bats and compare them to the stated weight. We found that stated bat weight is rarely what a bat actually weighs. Below we measured every bat we have for testing this year and put them in the table. We weighed the bat on a reliable kitchen scale. We also note the difference between the stated weight and the actual weight as well as identify what league the bats are made for. Are There USABat Weight Problems? Among the threads and pages we follow in the bat space, there has been a general sentiment that USABats are weighing more than they are stated to weigh. While that is true, our data below shows they do not weigh more than their stated weight any more than USSSA or BBCOR bats do. In fact, our average shows that USABat stated weights are more reliable than those of BBCOR or USSSA bats. USABats tend to weigh 1.13 ounces more than their stated weight while BBCOR bats are 1.17 ounces heavier. USSSA are the worst offenders on average and weigh 1.31 ounces over their stated weight. As we discuss at length in our best bat weight article, there is considerable difference between the stated weight, actual weight and the swing weight of the bat. In short, the stated weight is what is printed on the knob. Actual weight is what a bat literally weighs. The swing weight is how difficult a bat is to swing and becomes a function of the actual weight and how the weight of the bat is distributed along the length of the barrel. This article dissects the actual weight of bats. While it may be a useful exercise (and one factor in determining the swing weight of bats), the real important factor, that of swing weight, is not shown below. In other words, don’t read too much into the following. The right bat weight is still about the feel of the bat and that is really a determination of swing weight—not stated weight or actual weight. Why Do Bats Weight Differently than Stated? One of the very first things we noticed when we started seriously reviewing baseball bats five years ago is how many had a different actual weight than the stated weight. In fact, very few bats actually weigh what they say they do and most weigh more. Some even weigh upwards of 10% more than their stated weight. We have asked nearly every bat company why their bats weigh more than the stated weight. The most common response attributes the weight difference to the grip and end cap. 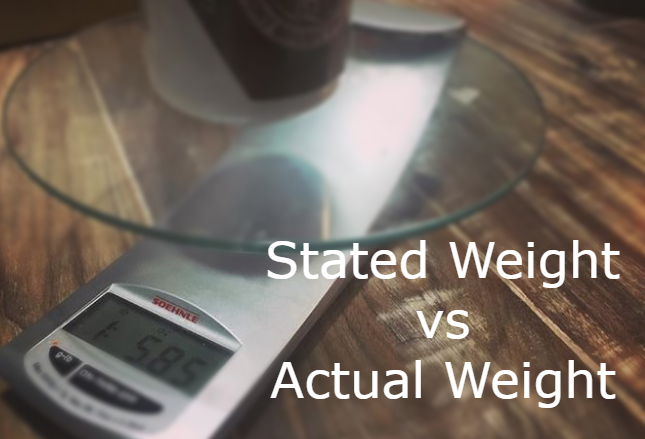 Companies with more accurate stated weights claim that companies with a wide margin between stated and actual weight simply have poor quality control. While we are sympathetic to their claim simply because we think the common disparity somewhat ridiculous, the fact the bats are consistently the same amount overweight is not commentary on quality control. Why no Drop 8.75 Bats? Rather, the difference is a function of companies trying to fit bats in a certain category while also producing a bat to a certain standard. Bats, especially youth and little league baseball bats, are categorized by the drop. (The drop, we are sure you know, is the numerical difference between the bat’s weight in ounces and length in inches). As such, if a company sets out to make a good drop 10 bat, for example, their tweaks and turns over the course of several months and years can reach the point where development pushes the bat off the exact target bat weight. And, when deciding between the perfect feeling and performing bat and redefining a new category of bat (say a drop 8.75), they opt for the less disruptive route. This is by no means an excuse for the bat companies, but it is at least a reasonable explanation. This is great stuff Ron. Thanks for the addition.